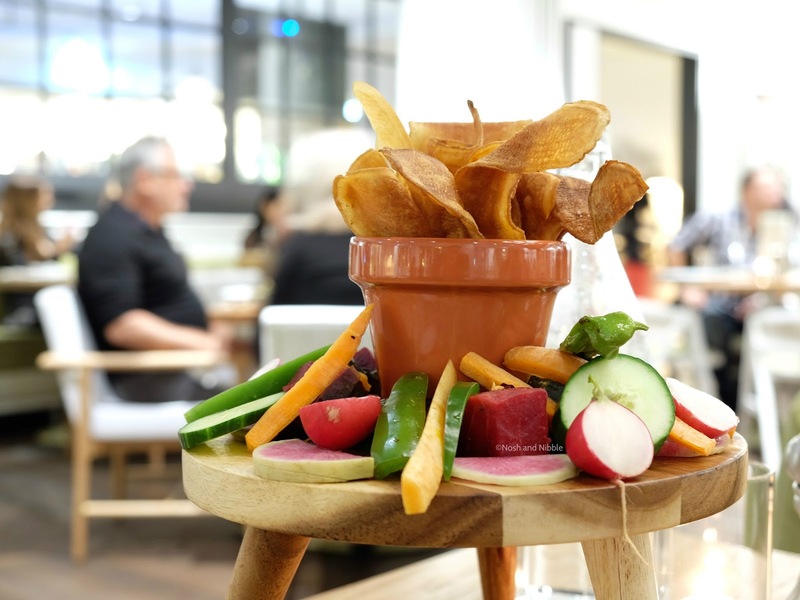 Located on the ground floor of Parq Vancouver, adjacent to the JW Marriot Hotel entrance, Honey Salt is a casual, modern eatery that offers a variety of fresh, farm-to-table dishes. We visited on a Saturday evening and the place was pretty busy. I was enamored with the homey yet elegant decor. The place had a comfortable and relaxing vibe but the beautiful table settings and the attentive service definitely made it feel like a place for special celebrations. In fact, two other tables near us were also visiting for a birthday dinner. For starters, we opted for the Little Louie Cup ($22). 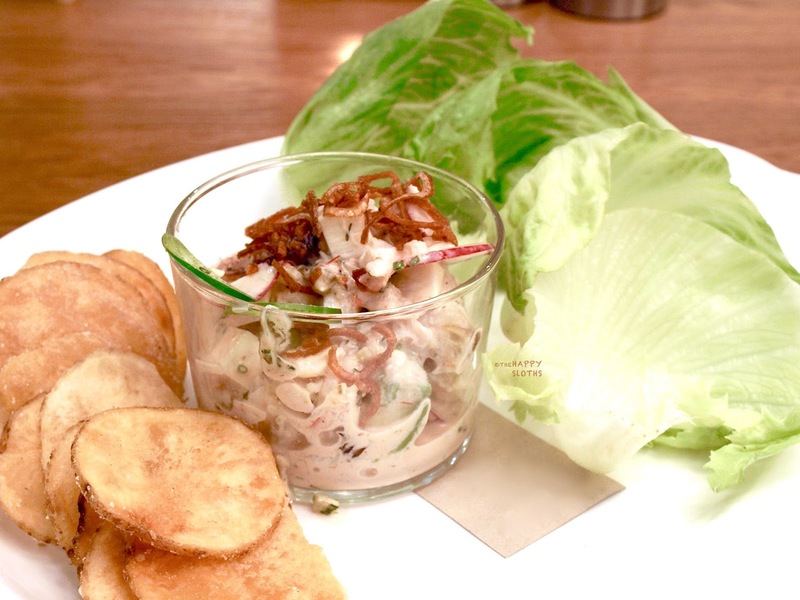 This dish came with a small serving of Dungeness crab and avocado salad. On the side were some housemade salt and vinegar chips and a few lettuce leaves for wrapping the salad. The crab salad was beautifully seasoned and fresh but my favorite part was actually the potato chips, which had a very satisfying crunch. I love vegetables so I also ordered the Honey Salt Market ($25), an assortment of raw and cooked fresh veggies served on an interesting stool and flower pot set-up. Based on the menu description, I thought this was a dish of roasted veggies so I was a little taken aback when it arrived at our table. Nevertheless, everything tasted fresh and yummy. The beets and kabocha squash, in particular, were sweet and hearty. 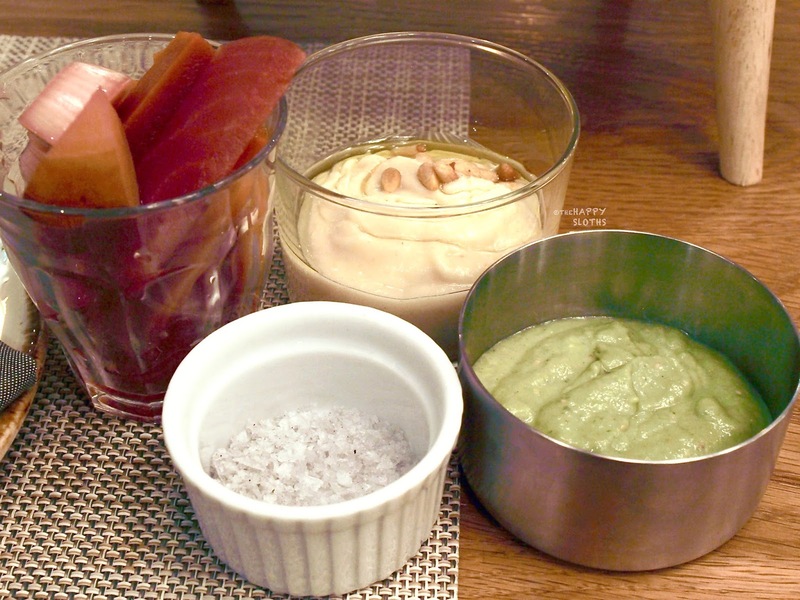 In addition to the veggie platter, the Honey Salt Market also included some sweet potato chips, pickled vegetables, cauliflower hummus, and "goddess dip", which is usually made with mayo, parsley, chives, and other herbs. I think this dish is definitely a healthy addition to any entree but I don't know if I would recommend it given its simplicity and cost. For the entree, we shared the Coho Salmon Steak ($34) and the Iberico Pork Secreto. 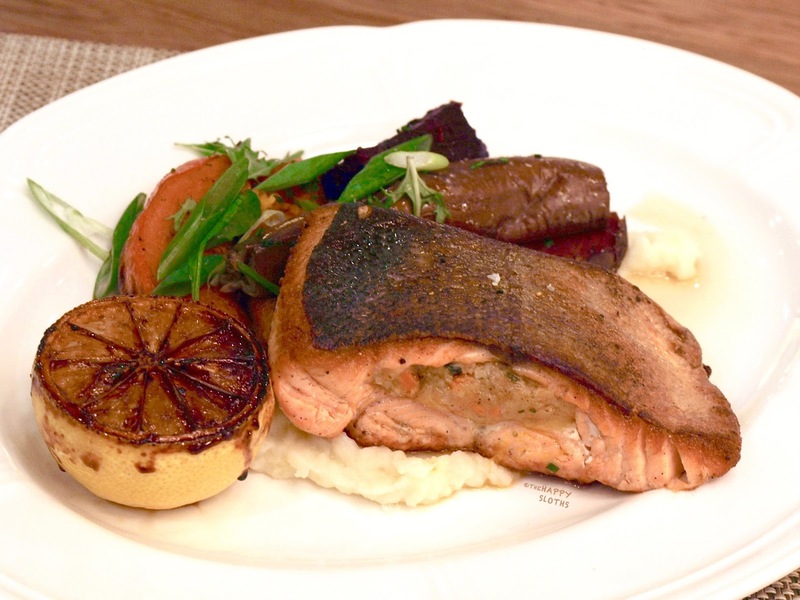 The salmon steak came with a healthy portion of Pacific salmon stuffed with Dungeness crab and served with a side of roasted vegetables. The salmon itself tasted just fine, a touch overcooked for my liking but the stuffing is very delicious. Also, there was something about the juice of a charred lemon that just added so much more flavor and oomph to the dish. Undoubtedly the best part of the meal was the Iberico Pork Secreto ($37). Fattened from feeding on acorns, the Iberico pig produces amazingly tender and marbled meat. The shoulder blade steak we were served was sliced into easily manageable strips. They were incredibly juicy and melt-in-your-mouth tender. Additionally, the pork was beautifully seasoned, served alongside some charred leeks, chickpeas, and roasted eggplants. 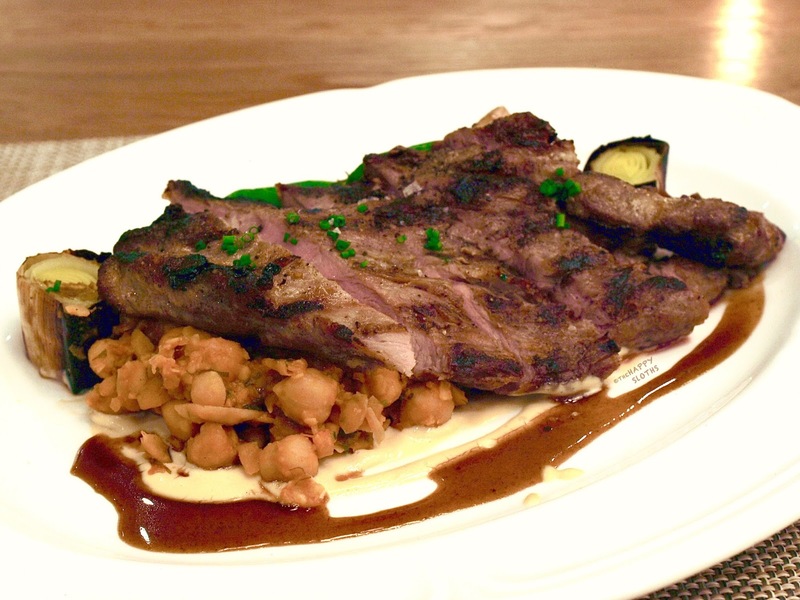 As someone who doesn't even like pork that much, I'd say that this dish is a must-try! Although we barely had any room left in our tummies, we knew we had to try something off of the dessert menu. There were quite a few tempting options but we ended up ordering the Society Chocolate & Banana Cake ($12), the most popular dessert item, as vouched for by our server. 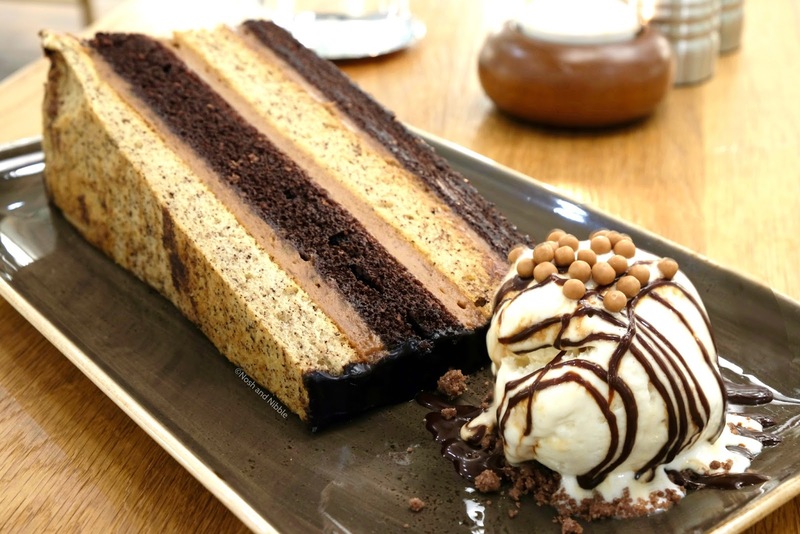 This was a massive multi-layered cake served with a scoop of ice cream that could easily satiate three to four people. The cake consists of rich and moist layers of banana bread, chocolate cake, milk chocolate mousse, caramelized banana sauce, and an outer coating of decadent dark chocolate glaze. We finished about an eighth of it and packed the rest to go. As a birthday treat, this was just amazing! As I write this, I still have a chunk of cake left over in the fridge (seriously, the serving was that big) and I cannot wait to finish every last crumb. Pro Tip: Heat up the leftover cake in the microwave for some extra ooey gooey goodness. 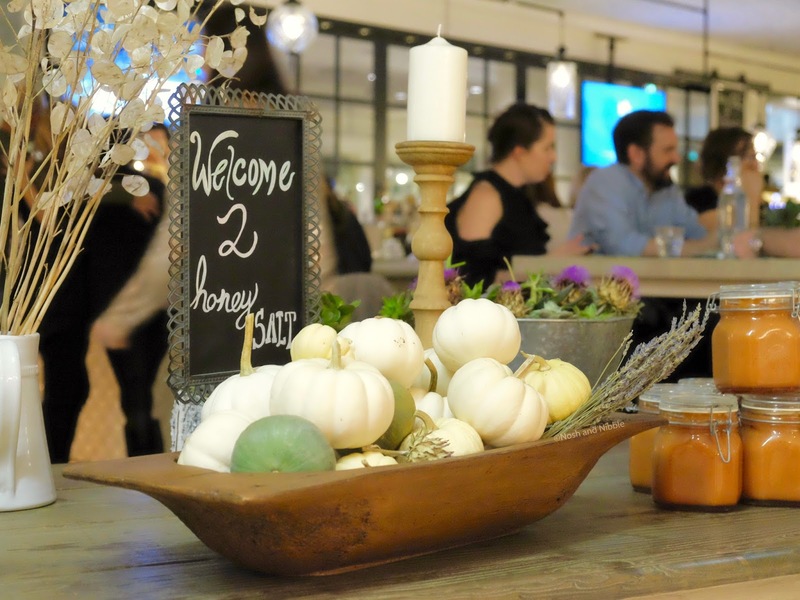 Overall, I really enjoyed my experience at Honey Salt. The restaurant decor was homey and charming while the servers were welcoming and attentive. I loved the relaxing yet sophisticated ambiance and the food was great! My personal recommendations are the Iberico Pork Secreto and the Society Chocolate & Banana Cake. If you plan on visiting for a weekend dinner, definitely make sure to reserve ahead of time! 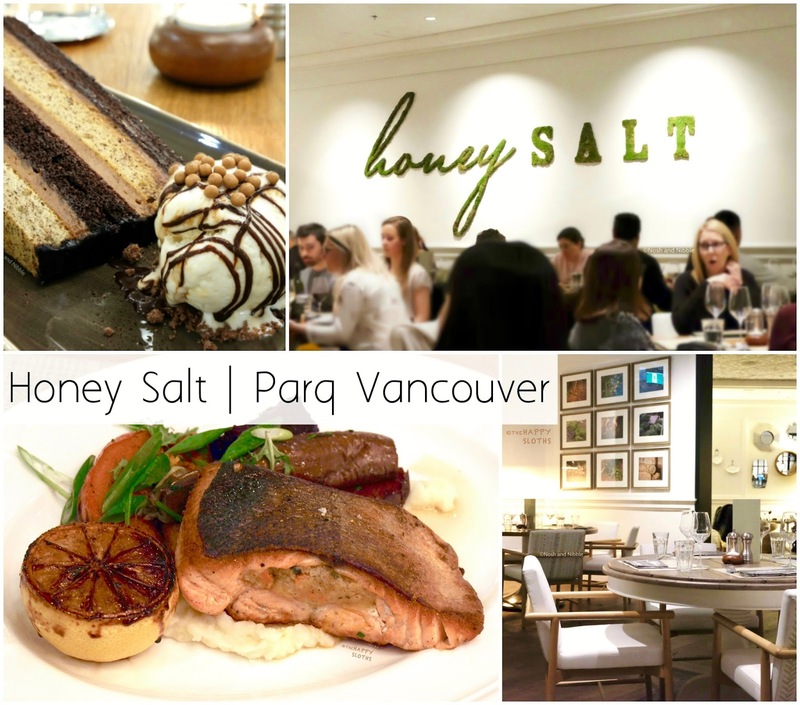 Located at Parq Vancouver in Downtown Vancouver, Honey Salt is a casual restaurant that offers a farm-to-table menu. 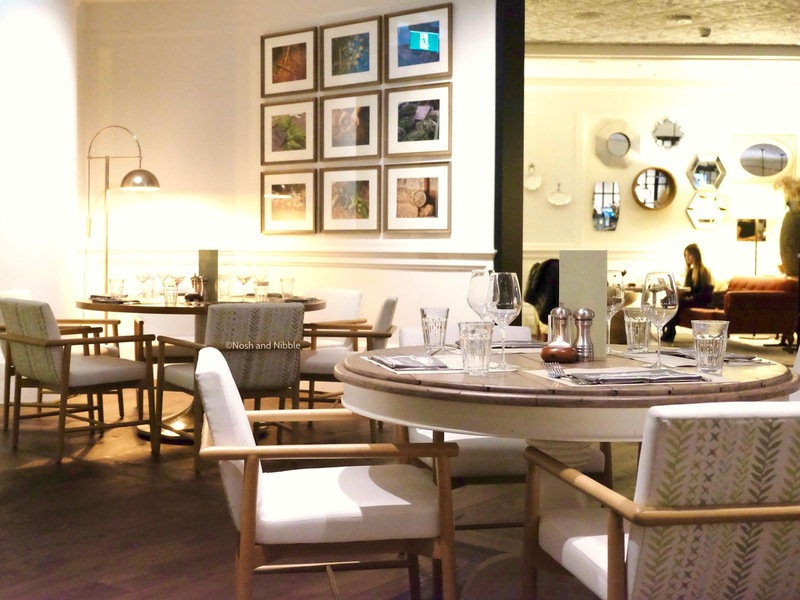 To learn more or book a table, visit honeysalt.ca.